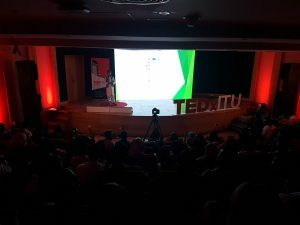 TEDxITU second chapter; Afraad Ke Hathon Main Hai. TEDxITU carried forward TED’s mission of ‘ideas worth spreading’ by gathering some of Pakistan’s brilliant minds as speakers on this day-long event. 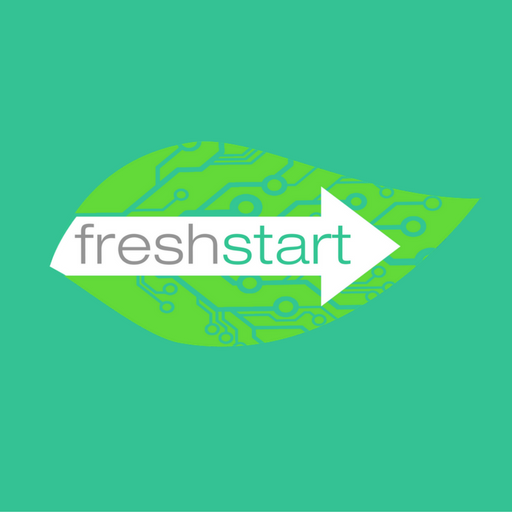 The event was supported by Inbox Technologies and was curated as a community-based platform. A massive number of 1100 applications were sent from all over the country out of which 300 were shortlisted. This event was divided into three sessions which covered an assorted selection of domains ranging from health, technology, entrepreneurship, arts and music. Each domain had an exceptional speaker to shed light on the topic. Mudassir Sheikha, Co- Founder Careem, talked on the subject of the local advantage while operating in a new market. Danielle S haraf, CEO Switch ITC, complemented Mudassir’s idea, by emphasized on her lessons learnt in the tech industry. Mohammad Raza, ITU’s 13-yr old computing prodigy brought the theme full circle by talking about his work on Rekhta – a program that slices the time reuired to type in Urdu to half – through intelligent auto completion. The creative streak in Pakistani youth is admirable. One such example is of Abdullah Ahmed who shared his vision for CricFlex – a startup for helping cricket bowlers maintains a legal bowling action through its patented technology. 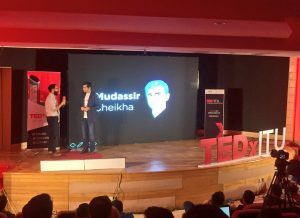 His startup reinforced TEDxITU’s theme which focused on, among other things, individual actions bringing together great changes in communities. TED Senior Fellow Usman Riaz, shared his vision for a thriving hand-drawn animation studio in Pakistan through Mano Animation Studios and his work on Glassworker – their first animated feature film. The event featured superb speakers who shared their works, all of which came under the banner of ideas worth spreading. Ahmer Naqvi, COO Patari, who argued for the importance of music in culture, social causes and identity formation; Nishat Riaz, Director Education British Council who made an impassioned case for places for higher learning not just higher education; Arshad Faruqui and his passion to create better public spaces through Pursukoon Karachi; Neha Mankani and her vision to counter emergency maternal health problems through Mama Baby Fund; TED Fellow Nighat Dad and her drive to create Digital Rights Foundation to counter cyberharrasment; Mariam Paracha’s work with communities to encourage free speech through spoken word; and Amina Rizwan, a metalsmith who shared her work with artefacts and the importance of our role as ethnographers in a heartfelt talk. 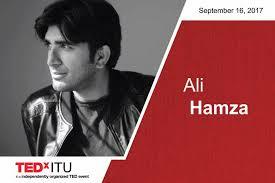 Pakistan’s rock sensation, Ali Hamza Noori concluded TEDxITU. He interwove his talk with pieces of original music as he transported the audience to the journey a musician experiences being wired to their work. Ali Hamza concluded his talk with an outstanding performance of the National Anthem. TEDxITU activity partners were Citizen Archive of Pakistan (CAP), PlanX – technology accelerator, MIT Enterprise Forum Pakistan, MIT Technology Review Pakistan, DIY Geeks, and Alooclan. 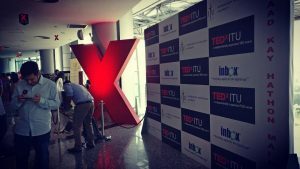 TEDxITU was supported by the ITU administration, including Vice Chancellor Dr. Umar Saif and Registrar Zaheer Sarwar and was a volunteer run event. Maker Fest makes a comeback this October!